John Elway was drafted first overall in 1983 out of Stanford with extremely high expectations, and he played up to them. During his 16 seasons with the Denver Broncos, Elway would win two Super Bowls and an NFL MVP award. This popularity has made his 1984 Topps rookie card one of the most popular of the modern era. The 1984 Topps John Elway rookie card will be one of those iconic issues that stands the test of time despite being produced in fairly large quantities. Examples of this card graded at PSA or BGS 10 (gem mint) have sold at auction for anywhere between $900 and $1,800, but of the over 14,000 examples of this card graded by the PSA, fewer than 75 have been graded gem mint 10. If you can afford one, a '10' is probably the way to go for investment purposes, but for a collector, it's a great situation. Because there are so many Elway rookie cards in existence, only the higher grades, those graded at PSA 8 and above, are valuable. Cards graded '9' can be found on eBay for around $100-125. That price has stayed steady and isn't likely to skyrocket so chasing a 9.5 or 10 is probably best if you're after long term growth. Collectors can grab a really nice Elway rookie for minimal outlay. Although these cards may seem much less valuable in comparison to other comparable players, low prices equates to low risk. 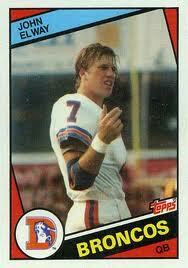 Time is the greatest asset to any investor who owns 1984 Topps Elway or Marino rookie cards. Rookie cards of older, comparable quarterbacks sell for more than ten times the current value of John Elway rookie cards. Even if these cards only appreciate to half the value, they will leave the investor with a nice profit as more people seek them out. Elway's Hall of Fame career and post-career success keep him in the spotlight. 1984 Topps John Elway PSA 9! !